Ever consider purchasing an indoor electric grill? 2. Place salmon on a work surface, and remove any excess fat. Feel for any small bones, and remove with tweezers or a strawberry huller. Place salmon flat on a large glass baking dish. Rub salmon with oil; sprinkle with sea salt and next 3 ingredients. 3. Squeeze juice of 1 lime over salmon just before cooking. 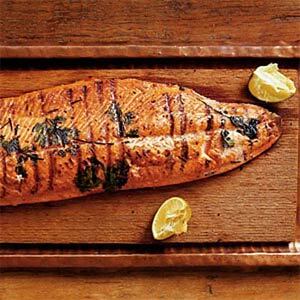 When the grill is hot, place salmon flesh side down, and cook, undisturbed, about 6 minutes or until salmon releases from grill easily and is golden brown on the cooked side. 5. Remove skin before serving. Serve warm or at room temperature topped with Cucumber-Avocado Salsa.